And it was all accomplished through the Advent story: God among us–Emanuel–comes in a tangible place in time and space. A real historical city–Bethlehem–in a real historical nation–Israel. There, the Anointed One was born in humility to one for whom it seems there was no end to her obedience. Mary seems to have taken all of this–the scorn, the frustrating birth, the unknowing–all with confidence in her God. She seems to have taken it with comfort and joy. But it wasn’t just her. 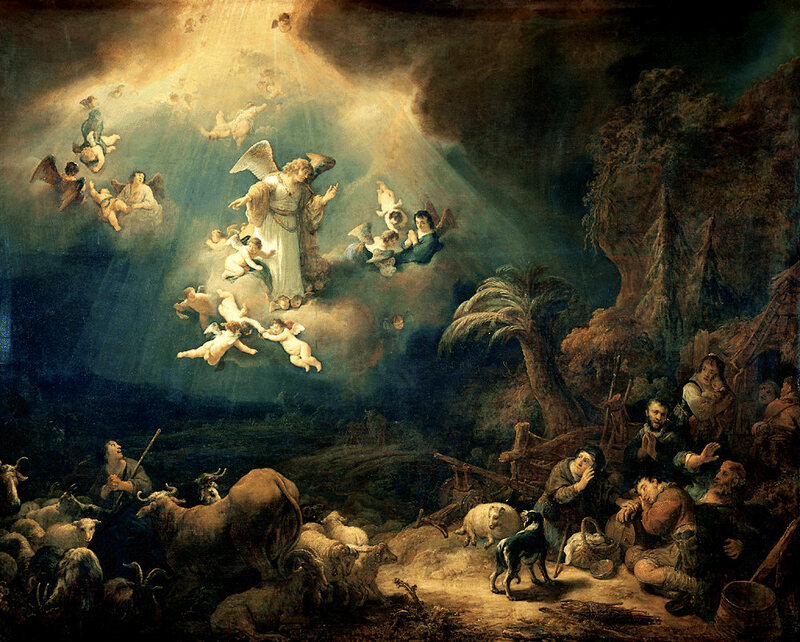 In the story, God seeks out the lowliest of lowly classes, sending a blessed angel to shepherds on a hill. He gives them not an inferior message or even a different one than the news heralded to Mary and us. God’s messenger gives them the same news and tidings: he speaks the name and place and authority of the child born. And he speaks over them the same message: comfort and joy. But even when rest, comfort, and joy are extended to us by God, we experience shame, doubt, fear, and uncertainty. There’s a reason this birth and this shepherd appearance happens at night. There’s weight to all of this. And yet, God’s angel commands the shepherds to not be afraid. This command, though, is not only concerning their fear of the angel or this message, but it’s a command that nothing would give them fear. One gets the sense that this moment was to prepare them for all of the their lives to come, and not just this evening. But what is the basis on which they should base this confidence? The Savior is born in the midst of the Miraculous. Natural laws have upended themselves for this cosmic moment. And for what purpose? To invite God’s people to Himself, to trust Him, and to free them from the Darkness and Might that enslaves them to themselves. In other words: comfort and joy. The shepherds hear the call. They feel the thrill of joy leap in their hearts, and they even leave their sheep in the midst of windy storms and rush to Bethlehem to see this Anointed Child. It was one of those fleeting moments where one has such absolute trust in God for their resources and livelihood they become joyously reckless with it. They risk their economic security, and for what? And they went to Bethlehem where Jesus was, and they found him, surrounded by animals on one side, and a praying, trusting mother on the other. Cattle and a scared pre-teen. These were the vestments in which the birth of God was clothed. I turn again to my prayer for you: the weary, tired traveler. The modern shepherd. You, who having heard these good tidings have sought out the Christ we celebrate this season. You who are tired of running, tired of hoping, tired of trusting. You who can’t seem to shake that little tiny seed of light and joy in your heart that sustains you–even when you want to abandon it, you cannot. You’ve seen the angel with the eyes of your heart, and you’ve heard it sing and proclaim that the dark whispers and quiet hauntings are not the truth. They are what you have been freed from. You shall not fear. Yes, I turn my heart to you, weary traveler. And I pray. I pray for all of you. P.S. As a funny Post-Script, I later found out that the way in which I interpreted this song’s first lines is wrong (as is the way most of us read it). It’s an interesting read.